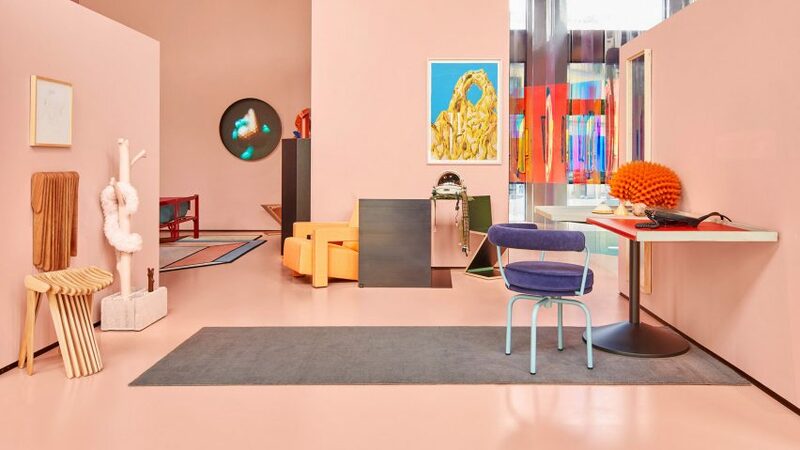 A spaceship-style shelter, and oversized "sofa island" and virtual-reality experiences all featured in furniture brand Cassina's Milan design week exhibition. 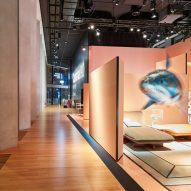 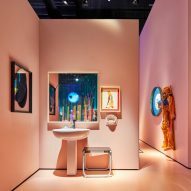 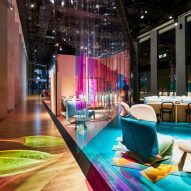 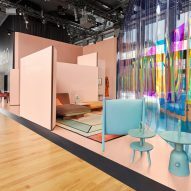 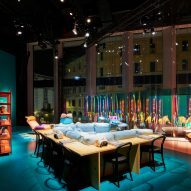 The Cassina 9.0 installation – shown at Herzog & de Meuron's Fondazione Giangiacomo Feltrinelli during Milan design week – showcased pieces from the company's archive and explored what the future might hold for domestic life. 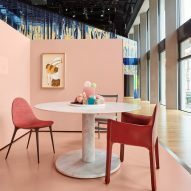 An area decorated in pale pink – seemingly the colour of the moment – showcased historic furniture, alongside projected imagery. 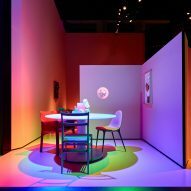 Chunky virtual-reality headsets were on hand to offer "interactive, engaging and ironic experiences" based on Cassina's products. 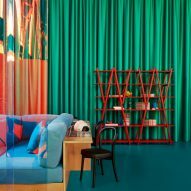 A separate area, marked out with bright green walls and curtains, functioned as an open-plan living space, with a "sofa island", created by Italian designer Piero De Martini in 1975, at its centre. 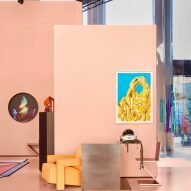 More VR headsets offered an alternative experience of the space, and a chance for visitors to immerse themselves in collages created by Finnish artist and architect Martti Kalliala. 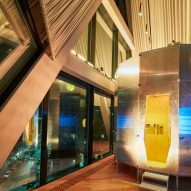 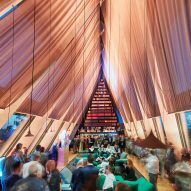 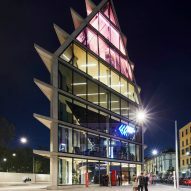 At the top of the building, the brand recreated a rocket ship-like mountain shelter – the Refuge Tonneau – which was first created by French architects Charlotte Perriand and Pierre Jeanneret in the 1930s. 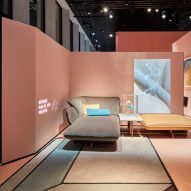 Elsewhere, Cassina filled a reading room with Konstantin Grcic's Soft Props sofas, which were also unveiled at Milan design week. 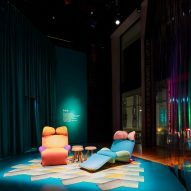 In the evenings, the space hosted talks, and visitors were encouraged to rearrange the modular sofas as beds. 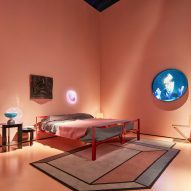 "As the architectural historian Beatriz Colomina explains, the 21st century will be the century of the bed, and thanks to technology we will be able to conduct so much more of our life from a horizontal position," explained Cassina. 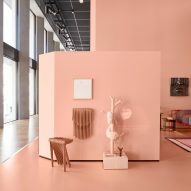 The entire exhibition – curated by Patricia Urquiola, who was appointed the brand's art director in 2015 – is themed around the brand's upcoming This Will Be The Place monograph, which will be published by Rizzoli in September 2017. 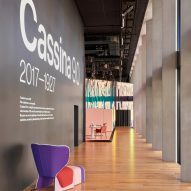 Cassina was founded by brothers Cesare and Umberto Cassina in 1927 in Meda in the Brianza region of northern Italy. 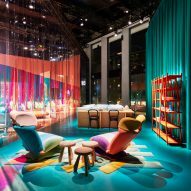 In 2005 it was acquired by Italian design group Poltrona Frau, which was in turn bought by American office furniture giant Haworth in 2014. 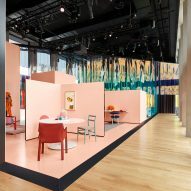 Fashion label Marni also created an immersive installation at Milan design week to showcase its collection of woven furniture, while SHoP architects set out to offer a moment of solace to visitors with a terracotta enclosure. 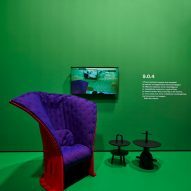 Photography is by Omar Sartor.